Darrin Nelson is most well known for briefly holding up the Herschel Walker trade in 1989. The Cowboys were dealt Issiac Holt, Jessie Solomon, Alex Stewart, and David Howard, along with Nelson and a slew of draft choices. Unwilling to report to the Cowboys, Darrin was traded to the San Diego Chargers. This set off a flurry of trades at the bell, that eventually resulted in then backup Detroit Lions RB Paul Palmer being shipped to Dallas. While Nelson was back home in California, I guess you could say his heart was still in Minnesota. He’d return to the Vikings in 1991 where he finished out his career. 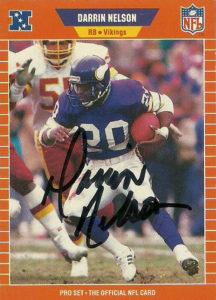 The Vikings first round choice (#7 overall) in 1982, Nelson was a dynamic rusher and receiver- somewhat of a rarity during the heyday of the ground game. During his time at Stanford from 1977-1981, he accomplished a feat that nobody had ever done before in rushing for over 1,000 yards and catching at least 50 passes. He did it not only his Freshman year, but repeated it again his Sophomore year and again in his Senior year. 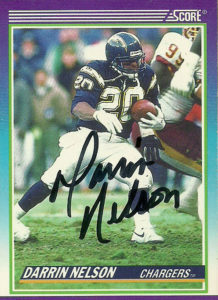 During his time in the NFL Nelson distinguished himself as a jack of all trades, rushing, receiving, and returning. 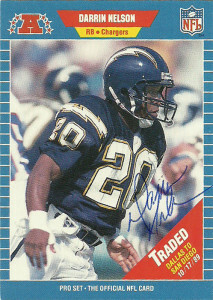 In 1986, Darrin had 1,386 yards from scrimmage and 7 TDs, and lead the NFL with a 4.9 yards per carry average in 1987. In 2014, Darrin was named to the College Football Hall of Fame. As of 2016, Darrin works in the external relations department at UCLA. 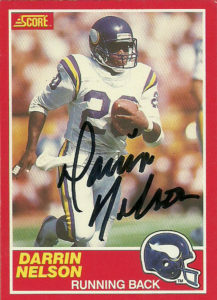 A solid signer through the mail, Darrin not only signed 3 cards for me, he read my letter and noted that I had enjoyed playing Tecmo Bowl as him back in the 80s.